Use on Refrigerator, File Cabinet, Metal Garage Door, School Locker, Dishwasher, Car, Truck... most Smooth Metal Surfaces. 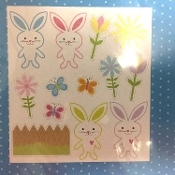 Cute festive, bright and colorful WHITE with Pastel PINK, BLUE, PURPLE, GREEN and YELLOW magnetic decor, fun to add to Easter baskets for the young and the young at heart! See photo for individual piece size perspective. 1-Magnet Set of multiple pieces, as pictured to make a complete puzzle. Colorful decoration - NOT a toy.